Welcome to Muffin Tin Monday. The blog link up that features and celebrates the Muffin Tin Meal. 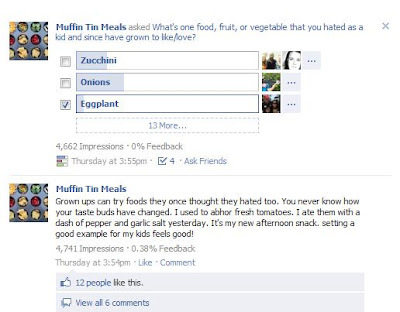 What is a Muffin Tin Meal? Well, simple put, it's a meal, snack, or dessert served in a muffin tin. Some might call it a muffin pan, a cupcake pan, or even a patty pan. We call it a muffin tin. And this little blog is the official home of the muffin tin meal. Each week I make muffin tin meals for my kids and share them with you. You are invited to join me each week. I would love to have you join in. Some of you come and go and some of you have stayed with me. Whether you participate, or just like to lurk, it's wonderful to have you! Everything in this week's Muffin Tin Meal is organic. Except for the kiwifruit. The kids graciously tried the kiwi fruit. It's not for everyone, but at least they tried it. I was hoping, since the kiwifruit is rich in vitamins and nutrients, that the kids might grow to like it. Did you know it has as much Vitamin C as an orange? Last week on Facebook, I mentioned how recently I tried raw tomatoes again and I now like them. It was empowering to share with my kids by example that they can keep trying foods they once thought they hated. Maybe their taste buds will change. Maybe they wont. But, trying is important. And introducing them to healthy nutritious foods is important. Now I need to think of foods I need to work on enjoying. it's so pretty. and it's mostly organic. also. today, my foods were not organic. it made me whiny. and i posted about that. Would anyone be interested in a pick exchange? It would be like a mini swap. We just bought some picks from OTC, but they come in packs of several dozen of the same thing. I thought it might be fun to trade with others and mix them up some, if there's anyone out there who is interested. We could even do picks and liners (paper) - just small, cheap stuff. I just got organic kiwis at Trader Joe's! My kids LOVE them, but they've been eating them since they were babies. Oranges they won't touch, lol.